Are you a persistent pain sufferer looking for relief beyond what you've been able to achieve through the effects of medications, physical therapy, and other common interventions? As you may know, persistent pain is becoming a health problem of epidemic proportions. Half of the adult population over 50 will develop a chronic pain problem at some point in their later lives. And, as worker's compensation and disability funds continue to dwindle, there is an increasing need for cost-effective treatment that is readily available to all age groups. To read what others have said about Maggie's approach to reversing chronic pain, click here. For more information and to purchase this book and/or CD visit Sounds True. Reversing Chronic Pain offers a dynamic framework for joining body and mind to speed the healing of traumatic pain from the body level up. Each chapter presents a body-centered skill set that can be mastered through a broad menu of practice exercises. The resulting interlinked somatic building blocks help readers shift from physical pain to body awareness, and from unstoppable suffering to heartfelt connection and peace. Building on the AIDS cocktail approach that reflects the fact that chronic pain is complex and no one tactic is likely to solve the problem, Maggie Phillips presents a 10-1 pain plan comprised of easy strategies based on somatic experience. Even if the reader’s pain is perceived as a “10” at the onset of the program, with 10 being intolerable, the somatic building blocks help shift the pain one point at a time until it gradually diminishes to “1” or even “zero.” Reversing Chronic Pain stresses self-treatment throughout, involving sufferers in attaining lives not simply endured but actively enjoyed. To order the book from amazon.com, click here. Maggie Phillips offers a series of teleseminars/webinars with leading experts in the areas of pain, stress, anxiety, and trauma. Maggie and the guest speaker present immediately usable treatment strategies from their areas of expertise. For the last 30 minutes of the teleseminar/webinar, the presenters take live questions by telephone or via internet messaging. All teleseminars offer a way to submit questions in advance and recordings of the live event, so live attendance is NOT required. For more information and registration for current webinars/teleseminars click here. Designed to further supplement the Reversing Chronic Pain book, the 10-step Online Tutorial Program includes group support, an interactive online community, multi-media presentations, audio practice exercises, and additional information and activities not contained in the book itself. 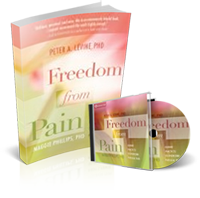 Designed for people who are not responding to typical pain interventions, this program of 4 audio CDs will provide you with a thorough understanding of how pain works, and will provide you with the tools to overcome it. To learn more about Hypnosis: The Pain Solution, click here. To learn more about Hypnosis: The Headache Solution, click here. Visit http://www.CarolLook.com/voiceamerica and look for Show #30 in the Archives on this site to listen to a recorded radio show with Maggie Phillips on Reversing Chronic Pain with Energy Psychology. Maggie Phillips, Ph.D is author of Reversing Chronic Pain: A 10-Point All Natural Paln for Lasting Relief (North Atlantic Books, 2007), Finding the Energy to Heal: How EMDR, Hypnosis, TFT, & Body Focused Therapy Can Help Restore Mindbody Health (W.W. Norton, 2000) and co-author (with Claire Frederick, M.D. ), of Healing the Divided Self: Ericksonian and Clinical Hypnosis in the Treatment of Post-Traumatic and Dissociative Conditions (W.W. Norton, 1995). Dr. Phillips is Director of the California Institute of Clinical Hypnosis, and lives and works as a clinical psychologist in the Oakland Hills above the San Francisco Bay. She has taught at major conferences on hypnosis, EMDR (Eye Movement Desensitization and Reprocessing), and Energy Psychology in the U.S., Canada, Europe, Japan, China, and Malaysia. As the author of numerous papers, articles, and chapters on trauma, dissociation, ego-state therapy, hypnosis, and mindbody healing, she specializes in the treatment of stress and pain disorders in psychotherapy and behavioral medicine. Dr. Phillips has also served as an expert witness in the area of dissociative disorders and posttraumatic stress conditions and provides individual and group consultation for psychotherapists and healthcare professionals. For more information on Dr. Phillips' teaching and clinical experience and treatment services, see About Maggie.